More details (and reviews) here. Today wasn't a particularly good day all round, for me or the nation. The Queen Mother died last week and it was her funeral this morning, in central London, at 11.30am. For me things went down hill as I rushed out of work, slightly later than expected, and my camera zoom lens fell out of my open topped rucksack. The inner barrel is now loose and it no longer focusses properly. Here comes another expensive repair. Luckily I have a less powerful zoom but it did mean that I had to stop off at home en route to London. Despite this I arrived in Paddington at 18:15 and, though too late to buy BOC tickets, with plenty of time to grab a sandwich and stroll along Oxford Street in time for the doors opening at 7pm. 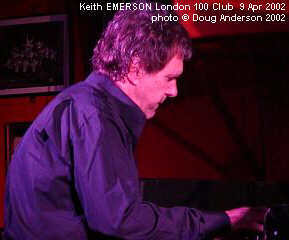 I won a ticket, one of 10 people I believe, to this preview of Keith Emerson's new CD, Emerson Plays Emerson, just four days before the show after answering a simple question contained within a flash promo email forwarded by John Arnold via his ELP Digest. Even more surprising was that the previous digest had appeared just a day or two before - and they are normally arrive once monthly. As I walked up to the door I wasn't sure what the evening held. I knew a few people I knew were going to be there, all competition winners and a mix of ELP yahoo group contacts and Deep Purple folk. I knew it was a sort of press function about the release of the CD and assumed that the few fans were there both to make up numbers and to add some atmosphere to proceedings. 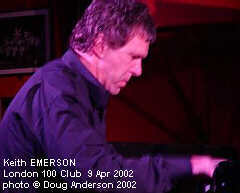 Whatever happened it promised to be a good night and should (I'd not been to the 100 Club before) provide a close up view of Keith Emerson in action. The venue was long and thin, stage in the middle of one of the long walls, almost opposite the entrance. Even getting in just after 7 all the good seats were fairly full (and they seemed to be reserved, I assumed, for the record company types and family) and the ony ones left were towards the grand piano end. Sitting there would leave no room to see Keith when he switched to Hammond, never mind the other two members of the Nice. Eventually I sat in a free seat next to two other competition winners, Lee from Newcastle and Paul from Cambridge. Both were pleased to be here and as surprised by the audience as myself. Just after quarter to eight, fifteen minutes later than advertised on the tickets, Mr Emerson climbed onto the twelve inch stage and thanked the audience for coming along before introducing the evening with "one way or another it's been a sad week, but a happy week as well" in reference to the funeral of the Queen Mother earlier in the day and, I assume, the release of his new album. He reckoned that by now "we've done enough mourning so now its time to boogie!" With that Keith sat down at the (real) grand piano that filled almost one quarter of the stage area, and the section closest to our seats. This opening piece was new to me and is, unsurprisingly considering the reason for the event, off the new album. Whether the music was indeed Cajun tinged I'm not sure but it was well played and the audience enjoyed it, bursting into huge cheers as the last notes faded. This reaction surprised me considering I assumed the audience would be mainly lethargic and restrained press and industry types. The hollers that erupted as soon as Keith finished the piece certainly put pay to that idea. He paused for a moment, allowing the cheering to subside, before explaining "that was a piece somewhat inspired by, er, (he almost forgot who he was talking about) what's his name, Dr John. I call it A CAJUN ALLEY which is a pun on occasionally, 'cos occasionally I do this sort of stuff!" 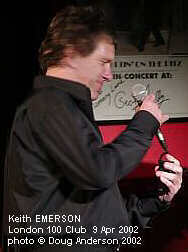 Minimal laughter probably alerted Keith to the fact that he was never going to make a stand up comedian like his good friend Jim Davidson (who wasn't here tonight). 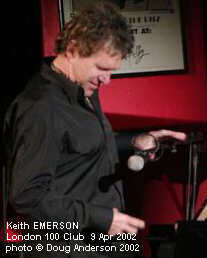 Keith moved swiftly on to the next one is, and something a little more familiar to me, CREOLE DANCE." Claps of appreciation, especially from the competition winners* no doubt, made it clear that others were also familiar through the versions on various live ELP sources from the 1992 tour.After the swift attacking introduction (though possibly neither as fast nor attacking as the '92 tour) the mood changed to a complex winding path that eventually returned to repeat the opening salvo that characterises the wild rhythms of Creole Dance. As the final note faded the audience paused briefly before showing their hearty appreciation for a musically, if not speech giving, on form Emerson. Again Keith stood up, banging his mouth on the microphone by accident, which elicited the comment "back to the dentist then!" Regaining his composure he soon encountered more problems - this time in fitting the microphone back into its slot. He did slip one good line in as he fumbled though, "It shows you how long I've been away from the stage!" As he kept trying with the microphone several people echoed the comment of "Too long" in reply. Eventually he gave up, holding both microphone and stand in position, and explained the music score he had with him admitting "I have got some music up here. I keep changing this piece and I just made a last minute adaptation to it last night. It's a ballad called and its called A BLADE OF GRASS." Again this is familiar as an ELP song and a pattern seems to be emerging. Some clapping preceded the gentle introduction to this short instrumental version that held the audience in silent appreciation. "It's a special occasion tonight because, I don't know if it is a surprise or not any more but I'll bring my old buddies out" explained Keith to laughing from the crowd as he changed his wording a little, "Less of the old." 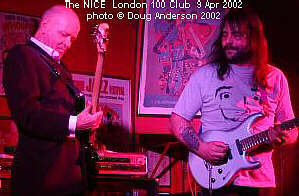 It had been thirty-one years (actually marginally over 32 I think, March 30 1970 to April 9th, 2002 - Doug) since they last played played together - a fact that had an the ecstatic audience clapping and hollering again - and "even the same road manager is here tonight. Baz, we've had him since the late 60's. 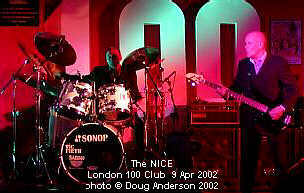 Ladies and Gentlemen The Nice!" A huge cheer erupted for this. 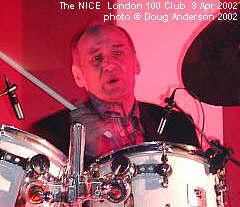 Keith announced the others as they reached the stage, "Brian Davison on drums and Lee Jackson on bass", though his voice was almost drowned by the cheering. Lee checked his bass, thumbing a few notes, before Brian settled behind the kit as Keith moved to the Hammond with an GEM electric piano above it. A quick equipment check for everybody before Keith introduced the first number, not one I'd expected from the Nice, HONKY TONK TRAIN BLUES. A rollicking barroom version ensued with drum and cymbal fills aplenty interspersing the shuffle beat from Brian while Lee held down his end with some tight andt controlled bass. Above all this was Emerson alternating between hammering out the main theme and adding some sparkle around the keyboard. A few years ago rumours abounded that the reason ELP were playing no more shows was that Emerson had a problem with his fingers. Tonight he appeared to have no problem at all. Initial looks of concentration on the faces of the three onstage soon changed to smiles all round as they realised the music was working. The audience agreed and largest round of applause so far followed. As it died there was no inter track banter, just a brief pause before The Nice moved into another unexpected track, again from the new Emerson CD. This time it was a slow, initially almost stalling, piece called SUMMERTIME (by Gershwin) . Keith didn't know if we knew he was "writing an autobiography. We did an infamous version of America..." interupted by a few cheers and claps of recognition, but only a few before he added "which got me into a lot of trouble…" It seemed obvious what was coming next but there was to be a little delay as Keith had with him a printout of said work and, even though he wasn't sure if we'd be interested in the story, he began reading a passage based around a meeting with Leonard Bernstein (composer of America). The place was Paris, the time around 1976, while ELP were mixing the Works Vol. 1 album. Keith and manager Stuart Young were invited to a Bernstein concert and afterwards "to be received by the maestro himself." Rather than taking his retribution the only comment Bernstein made after eyeballing Keith's attire was that "he liked my leathers and what was I doing in Paris, particularly later that night." Relieved that the subject of America hadn't come up Keith mentioned his piano concerto whereupon he he was given directions to a little out of the way bistro and he'd be "delighted if I could join him there later." With the obvious worry (America being brought up) that "it was his turn to (honked a horn to self censor) me" over they went on to the sawdust floored bistro and waited over a bottle of wine. Just as they were about to give up when "the maestro" appeared and completely ignored them all through the following meal. Eventually Bernstein addressed the room with "heavy overtones of sarcasm" that "Mr Emerson over here has written a piano concerto ." Keith failed miserably with an attempted American accent but continued with the Bernstein impression, "Tell us Mr Emerson how many movements does your piano concerto have?" Despite the attempt to rile him with "Ooh, three movements only!" Keith retained his composure explained the piece and invited Bernstein to "hear it for yourself" and gave him the address. The following evening Greg and Carl were forewarned as to the possibility of a visit, Keith hoping they would be on their best behaviour. Greg wasn't impressed saying only "so (parping of horn) what" was Greg's reaction. When he arrived the only one interested was Keith, Greg's welcome being, "Hi Lenny baby, how they hanging?" With that 'Lenny baby' made no reference to America but was complimentary while listening to the piano concerto and a piece called Pirates while consulting both scores and watch(?). at one time. Bernstein expressed a concern that sometimes he feared he sounded "too much like Beethoven whereupon Greg pronounced "I wouldn't worry about Lenny baby you'll never sound like Beethoven. "" At that point Bernstein left" and the tale ended with the audience laughing. 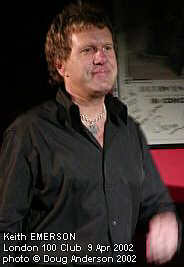 Another extract from the autobiography "Pictures Of An Exhibitionist" can be found here: http://www.keithemerson.com/autobio.html. With that the it was time for the finale and the tune I think the entire audience had been waiting for. The sustained keyboards chords and drum pattern provided a familiar introduction to a twelve minute plus version of AMERICA (which moved into RONDO). 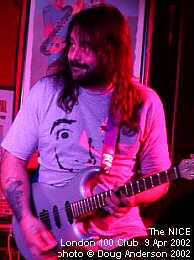 Phil added guitar in a complimentary way rather than trying to swamp the keyboards with fast runs while Lee underpinned everything with some warm basslines. There was no painted flag burning here tonight, just a mile of two from the Royal Albert Hall, just tight music with a band that sounded surprisingly well rehearsed considering all they had was three hours that afternoon. All the musicians worked to a crescendo , led by Emerson and Davison, before switching to the RONDO theme and then the keyboard mayhem began in earnest with racing runs and swipes along the keys to provide that swirling sound so familiar to the audience. 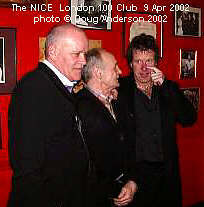 This was a band enjoying revisiting their past and bringing things up to date by including Phil. 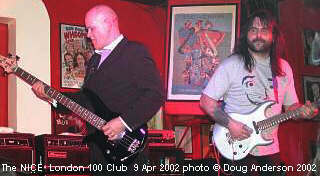 Phil kept fairly much out of the way for most of the tune letting Emerson rip like the old days. I have to say it was a pleasure the see the gig but even more to see how much everybody was enjoying themselves, band and audience alike. If the planned full show does come off I for one will be there. With a brief thank you to EMI, "Thank you for letting me make this record. 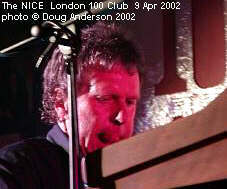 My name is Keith Emerson" the band trooped off the stage to disappear backstage for interviews. Despite cheers and calls for more that was all the musicians gave us (and probably all they had prepared) so we had to settle for talking about the experience over another beer (it was only twenty five past eight, normally the time a support act comes off stage). Many people left fairly soon after the music ended, the industry types I suppose. Those that stayed had the chance to get a few items signed, the smarter thinking going upstairs to collect tickets for the purpose. As well as the various Nice CD sleeves I had brought the few Emerson photos I had taken and managed to get a couple signed, one from a German Festival in Lahr 1997, the other from a couple of years ago when Keith, made a surprise guest appearance with Qango. A few final thoughts on the event. 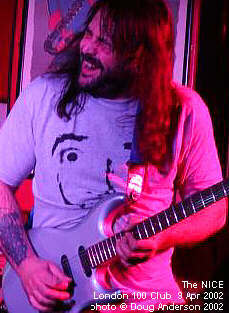 There were no songs, just instrumentals, so it was hard to tell how Lee Jackson's voice would be in a live situation. As it was an Emerson promotion I guess the lack of other Nice tracks may have been expected and I suppose that almost two thirds of the time The Nice spent playing music (they were left standing while Emerson read from his manuscript) it was America/Rondo. In the end I was surprised that the audience reacted better than I expected for what we competition winners assumed was an industry audience. I think a lot of them were more fans than industry types and maybe also relatives. At least 2 video cameras were recording the event, I stood in front of one by accident while taking photos. The other was up front in front of centre pillar. The book excerpt sounded good so hopefully it will actually come out as promised. As we were being ushered out by security as the clock ticked towards nine thirty I spotted Chris Welch and Neil Jeffries and was told Malcolm Dome and Krusher Joules were also there from the rock press. From that I guess we can expect some coverage in Classic Rock magazine as well as one or two others. *The question we had to answer to gain entry this evening was which composer provided the inspiration for the track. Even if you didn't know you could always check out the home of the John Arnold 's ELP Digest, http://www.brain-salad.com/, and in particular the page dedicated to Emerson's musical quotes: http://www.brain-salad.com/Emerson/quote-list.txt created by Steven Plotczyk and maintained by Jim Smith. Than answer is of course Alberto Evaristo Ginastera. 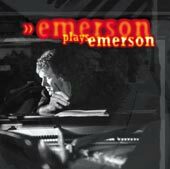 The CD 'Emerson Plays Emerson' has now been released and should be available in a store near you. It will probably be in the Classical section though I'm sure copies will also sit with ELP or other Emerson solo recordings in the Rock and . Pop and/or soundtrack racks. Further details from EMI Classics (biography, press release) or buy an autographed copy from the Emerson sales page. 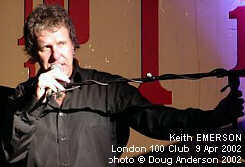 Since this show Keith has been appearing on radio stations all over the UK. 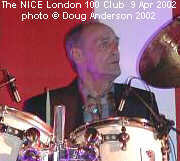 I have heard two of these, TotalRock.com and BBC 6Music with Bruce Dickinson. Newspaper articles such as this from The Guardian (31 May) also show EMI Classics to be doing a good promotional job. In addition other live appearances have included playing for Her Majesty the Queen as part of her golden Jubilee celebrations. 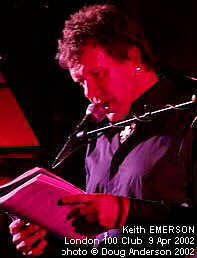 Read about the latter at http://www.keithemerson.com/emo_meets.htm. 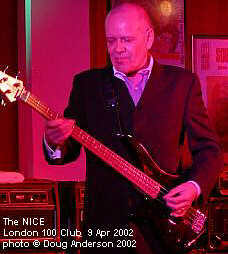 The original guitarist with the Nice was Davy O'List. You can find out more about him here: http://home.ix.netcom.com/~dfirmin/olist.html. 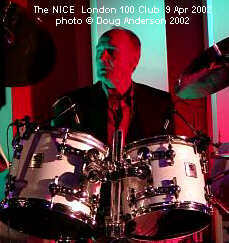 Phil Hilbourne played at this show though and his site has more photos from the evening. Three in particular caught my attention, one from the rehearsal (without Emerson it would appear), and a couple with Emerson playing the organ from behind. As it is a frames based site it is difficult to provide a direct link to the photo page so go to the site, click on Gallery and then the Miscellaneous image at the bottom of the index page. The show will feature more than just the Nice though. More details are here. 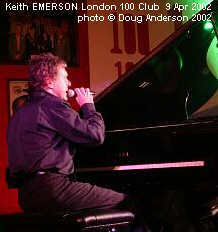 Guardian Unlimited havea Keith Emerson interview online from 31 May 2002. An alternate review of the show appears in issue 6 of Portuguese language Musical Box magazine www.musical-box.org/. Reviews of the actual CD can be found here: RP-online.de,. In a chance bit of good timing a book on the Nice, "Hang on to a Dream", by Martyn Hanson is due from Helter Skelter Ltd (www.skelter.demon.co.uk ) around the same time as the tour. Below is the promotional text I was sent today (20 Aug 2002): . If you enjoyed the review then feel free to leave comments in my guestbook. This page is Copyright © Doug Anderson 2000 - 2002. Created: 9 April, 2002. Last updated: 5 October, 2002.